Established in 1932 by AT co-founder Myron Avery, the RATC is responsible for over 120 miles of the AT between Route 611 in Giles County and Black Horse Gap on the Blue Ridge Parkway. Club bylaws require the group to support monitoring and managing lands that were purchased for trail protection, to participate in and encourage the development of laws and regulations that protect the AT and its related interests, and to use all legal mans to protect and defend the AT and its related interests. Necessity of compliance with the National Environmental Policy Act of 1970 and the Endangered Species Act of 1973 to examine cumulative impact of all proposed major natural gas pipeline crossings of the Appalachian Trail. Satisfaction of criteria in the Appalachian Trail Conservancy’s 2015 Policy on Pipeline Crossings of the Appalachian Trail. Careful and realistic study of visual impacts of the proposed Alternate 200 route, with specific viewpoints and criteria noted in the club’s November 2015 comments. RATC strongly believes that the pipeline is likely to be visible from numerous locations on the Appalachian Trail and poses potential safety hazards to AT users. Based on photos taken by RATC members and on a visibility study conducted by Key-Log Economics, RATC believes that the pipeline crossing of Peters Mountain, its route across Mystery Ridge and the New River Valley could be visible for up to 7.2 miles from Angel’s Rest. The pipeline would likely be visible as well from ledges on Pearis Mountain and from Sugar Run Mountain, all in Giles County. Erosion from 10 to 12 inch new pipeline on Peters Mountain. Developer proposes a 42 inch pipeline across the same mountain, crossing the AT. What would it look like? A new 10 to 12 inch pipeline on the same mountain gives a preview on a much smaller scale. The Celanese pipeline in Narrows in highly visible from US 460 and has already experienced serious erosion problems. The pipeline would cross the AT at one of its most scenic points in Virginia and would be visible at many locations on Peters Mountain, including Symms Gap Meadow, the area around Rice Field Shelter, and the Peters Mountain Wilderness. The slopes on Peters Mountain, where the developer proposes to cross the AT, are at grades exceeding 40% and even 60% in karst areas with many potential sinkholes located near the center of the Giles County Seismic Zone, scene of the largest earthquake in Virginia history. 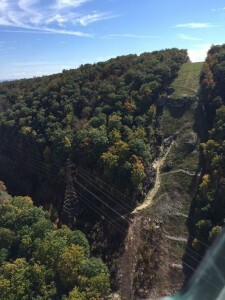 A study published on July 3, 2015 (“An Expert Report on Geologic Hazards in the Karst Regions of Virginia and West Virginia”) concluded that the route proposed by Mountain Valley Pipeline is a too dangerous for such construction and should be considered a “no-build” zone due to potential impacts on major water supplies for the region and the heightened possibility of a catastrophic failure. The author, Ernst Kastning, is a retired Radford University professor and recognized expert on karst geology. Natural gas pipelines constructed since 2010 are notably less safe than pipeline built at any time since the 1940s, with two to six times as many dangerous incidents as other pipelines built within the past 60 years. (See Figure 5 in this April 2016 study by the Institute for Energy Economics and Financial Analysis, using public sector and industry data). The proposed route returns to the AT viewshed when as it enters Craig County in Sinking Creek Valley before crossing Sinking Creek Mountain, Craig Creek, and Brush Mountain. It would also be visible from Brush Mountain, including the Brush Mountain Wilderness. This segment is particularly noted by Kastning in his analysis of karst topography and his conclusion that it should be a “no build” zone. The Virginia Department of Natural Resources has also expressed concerns about construction of the pipeline in the Canoe Cave karst area. 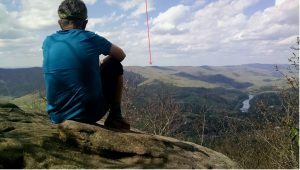 RATC expects to conduct more detailed studies of the potential impacts of the pipeline on the Appalachian Trail, including the strong possibility that several miles of the pipeline would be visible between McAfee Knob and Campbell Shelter if it were permitted to climb the very steep slopes of Poor Mountain in Roanoke County.